A perfect gift for the whisky drinker! 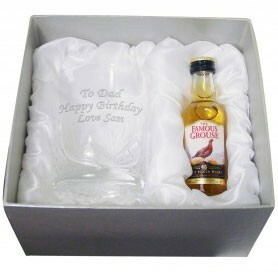 This gift set is beautifully presented in a grey silk lined presentation box with and engraved whiskey tumbler glass and a 5cl whisky miniature. Personalise with 3 lines, 20 characters per line including spaces.